Signed as a free agent on July 18, 2017. Begelton originally signed with the Stampeders on May 17, 2017, and he was released on June 17, 2017. He attended rookie mini-camp with the National Football League’s Atlanta Falcons in 2016. He also had a tryout with the Oakland Raiders in 2016. (Calgary) Begelton started seven regular-season games and established career highs with 25 catches for 488 yards. 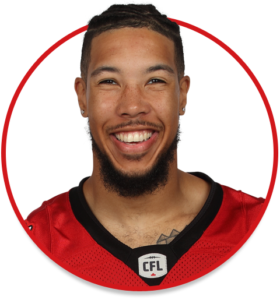 He was named a CFL player of the week in Week 14 after making five receptions for 150 yards including a 99-yard catch-and-run touchdown that was longest reception of his career. Begelton also returned one kickoff for 21 yards. He suffered a season-ending arm injury in a Week 16 game against Toronto. (Calgary) Begelton played nine games including five starts and had 22 receptions for 304 yards and one touchdown as well as one defensive tackle and two special-teams tackles. He made his CFL debut in Game 7 at Toronto and caught his first CFL touchdown in Game 12 against BC. Begelton played 46 games over four seasons (2012-15) at Lamar University. He graduated as the Cardinals’ all-time leader in catches (227) and yards (2,435) and was second in touchdown catches with 20. Begelton was first-team all-Southland Conference in 2015 and a second-team selection in both 2013 and 2014. He set a school single-season record with 82 catches in 2013 and a single-game record with 18 catches in a 2013 victory over Stephen F. Austin. Begelton was a first-team district all-star in his senior season at West Brook High School in Beaumont, Tex., after making 52 catches for 866 yards and nine touchdowns. He was a chemical engineering major at Lamar.